In a (very small) nutshell: With a lot of work. Basically, what it comes down to, is the more effort you put in, the more rewarding it will get. Sound familiar? Your teacher, coach or parents might have said pretty much the same thing. OK, maybe a bit out there, but you get the point. I want to take an example of a service and the guy who founded it. Well, there’s two guys, but I only need the one for this example. Triberr came on my radar screen like a tiny blip. The then invite only service required me to ask for an invite through Twitter. I got one soon enough (thanks Barry) and I enjoy being part of Triberr. And, obviously, I have followed it and its founders ever since. So, Triberr is all about networking, sharing, creating great content and being social. And, at the moment, nobody does it better than Dino Dogan and Dan Cristo. Dino, in particular, seems to be tireless and omnipresent. Every time somebody mentions Triberr, he’s there, leaving a comment, saying thanks or being helpful. He invites (very ordinary) bloggers to his tribe(s) and, of course, shares their content. The posts he writes about Triberr, on DIYBlogger.net, are very open and honest and he replies to all the comments. And, occasionally, let’s a guest blogger take front and center. I see Dan a little less, although I follow him too, but Dino always mentions him. In the posts it is always “Dan and I were thinking…”. In the spirit of founding a social platform Dino takes what he preaches to hart. Naturally, he has an objective. Creating awareness around Triberr and in the process around himself. And he does that well. So well, in fact, that I chose to write a post about it, obviously adding to the awareness. 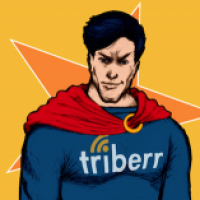 The growth and development of Triberr proves that a strong social presence can have a good return. And creating a successful online presence takes effort, a lot of it.